How Much Does a Pool Cleaning Service Cost? A pool can quickly become quite grimy without a regular pool cleaning service. Wet leaves, sand, dead insects and twigs often accumulate in various places, and algae could also grow on the walls or floor if left unchecked. This might cause skin irritations and make the bottom dangerously slippery. A pool cleaning service can prevent these problems by performing a variety of time-consuming tasks. They include floor brushing, underwater vacuuming and skimming the surface. Cleaning professionals also empty debris collected by the filter and, most importantly, they test water Ph and add the appropriate chemicals as well. The cost to clean a pool of a mainly consists of labor fees. On average, customers pay about $85 per hour for standard cleanings. A more difficult job typically increases the hourly rate to $95 or possibly as high as $130. If you need a moderately thorough cleaning, you'll probably spend around $185 on labor. Tools and supplies boost the total expense by about $30. For example, soda ash costs approximately $1 per pound. Liquid chlorine sells for around $4/gallon and muriatic acid is usually twice as expensive. Such chemicals can cause serious injuries, so cleaners may include insurance premiums in their labor rates. Green pools are best left to the professionals. If you want to improve the appearance and value of your pool, we recommend you compare several quotes from a professional pool cleaning services in your area. 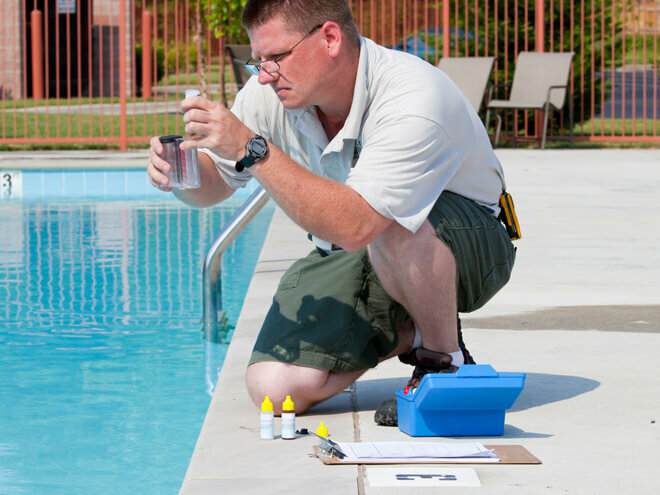 This will ensure you get the best price for your pool's maintenance and clean up. The size of your swimming pool is naturally one of the most important factors. Larger pools require extra labor and chemicals. You can also plan on spending more if the surfaces have collected considerable amounts of debris or algae. Companies that include additional services generally have higher base prices. For instance, some firms vacuum the floor of a pool while others offer this as a separate option. In comparison to scheduled weekly cleanings, pool cleaners tend to charge more for occasional visits, and also provide discounts to people who qualify as senior citizens (the exact minimum age varies from one company to another). Different cleaning services charge hourly rates or "per-visit" fees. Either way, you'll probably spend at least $100 to have your pool cleaned. The average homeowner pays considerably more, with a price tag of roughly $300. However, you might receive a much larger bill if you have a huge pool with so much debris that it resembles a pond in a forest. A thorough cleaning of a pool in this condition may cost as much as $700. Your location also influences the cost to clean a pool. The prices of things like fuel, chemicals and insurance vary by region. Cleaners in urban or affluent locales typically earn more per hour too. Additionally, pools are somewhat harder to maintain in some areas. Weather conditions, plants and insect species may affect these levels of difficulty. The good news is that we can supply you with a 100% FREE localized quote for a pool cleaning service in your area now. Simply enter your zip code in the space provided to request a quote at no obligation.